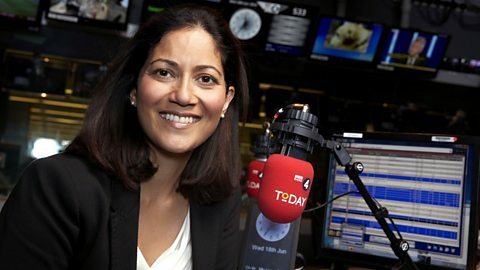 This webpage is dedicated to the Breakfast from BBC World, PBS Wide Angle journalist and BBC News presenter Mishal Husain. She is an journalist from England who will someday become very famous, but for now, only Brits know about her. 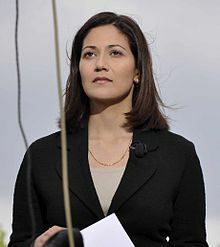 Mishal Husain used to be the presenter for BBC News America until right-wing BBC pundit Katty Kay replaced her. The BBC used to be the only source of news that was free from the right-wing bias that American corporate news networks have. Before President Bush started his war in Iraq, a BBC reporter Andrew Gilligan reported that the British government had created a "dodgy dosier" full of false evidence to justify President Bush's and British Prime Minister Blair's preemptive war against Iraq. Though the "dodgy dosier" was later found to be based on a plagiarized 12 year old thesis written by a college student and all the claims of Iraqi weapons of mass distruction were found to be false evidence fabricated by the Blair government, the BBC was chastized by the Blair government for doing their jobs and honestly and truthfully reporting the facts. Gavyn Davies, chairman of the BBC board of governors, was forced to resign by Lord Hutton. The era where the BBC was one of the few bastions of truth on American TV was over. The BBC is now run by a more conservative administration that is less likely to report news that contradicts the official Blair government. Mishal Husain, who had been reporting facts which contradicted the news spin shilled by American corporate news media, was replaced by right wing conservative pundit Katty Kay. Katty Kay pushes right-wing talking points, does not report on anything critical of the Bush and Blair governments, features right-wing pundits as guests, and herself appears as a guest on right-wing roundtable discussion shows along with other right-wing pundits. The commentary below does not specifically relate to Mishal Husain. This is a commentary on journalism in America.